This Nissan NV200 SV Commercial Compact Mini Cargo Van is loaded with features including a backup camera, NissanConnect with navigation, rear parking aid, after-market cargo barrier, cargo floor liner, power-heated outside mirrors, remote keyless entry, chrome grille, steering wheel audio controls, Bluetooth, HD 150-amp alternator, front anti-roll bar, black door handles, light tinted glass, chrome grille, two 12V DC power outlets, low tire pressure warning system, cruise control, and 15-inch wheels with split 5-spoke wheel covers. There are also six floor-mounted D-rings in the cargo area. The GVWR rating is 2,165 kgs (4,772 lbs). 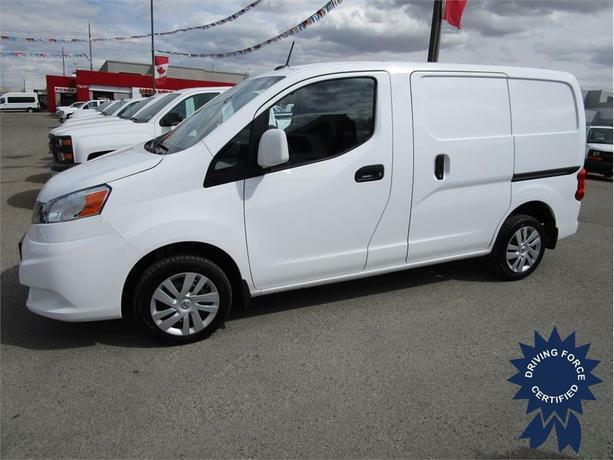 Best of all, it has Canadas best commercial van limited comprehensive warranty with 160,000 kilometres or 5 years coverage (please contact a DRIVING FORCE sales representative for warranty details). With this elongated warranty, this is the perfect way to have a piece of mind to ensure your purchase will keep up with your on-demand needs with the least amount of possible down time. With all the rigorous testing Nissan has done, you can have a lot of pride knowing this is a worthwhile investment for your business. Touch base with us to discuss purchasing or financing options that are right for you and experience the difference you will only find at DRIVING FORCE Vehicle Rentals, Sales and Leasing.